When you purchase used powder coating equipment, there’s no guarantee you’ll get what you need. For many businesses, investing in capital equipment is the largest purchase decision they are likely to make. It is not surprising that many business owners, coating line managers and purchasing agents look to reduce their businesses’ expenses by purchasing used or salvaged equipment. This can sometimes appear to be a very effective way to save money – however, the reality of new vs used powder coating equipment, the potential problems often far outweigh the anticipated cost savings. It’s true that buying smaller, less complex tools, such as a saw or welder, from a used equipment dealer or directly from the previous owner may save you money. Unfortunately, that’s rarely the case with more complex machinery. Powder coating booths and ovens are prime examples of equipment that is almost never a good value to buy used, no matter how low the price. A powder coating system should be matched to your specific requirements, but the likelihood of you finding exactly what you need in a used system is very slim. By the time you have modified, upgraded, refitted and refurbished a used or salvaged coating system, you will have often spent as much – if not far more – than if you had invested in a properly sized new system from the start. For this article, we reached out to a few of our clients (some purchased new equipment from Reliant Finishing Systems instead of buying used, and some first bought a used system before investing in a new Reliant system). We asked them to tell us about their experiences while shopping for their coating systems. Our goal was to find out what challenges a used powder coating system can present to a new coating operation. The feedback we received was overwhelming; if you’re considering buying used equipment, don’t do it! Very few used ovens or powder booths have a warranty for their parts. Your oven is the heart of your coating operation, so any downtime can kill you. If the oven goes down, you will be completely unable to cure your parts. Along the same lines, a motor failure or damaged/clogged filters in your booth can leave your coating line at a standstill. Without a warranty on hard-to-source parts like specialized bearings, fans, and burner components, repairs due to mechanical failure are potentially very expensive and time-consuming. Another issue is that used powder coating equipment has often been modified by previous owners. Figuring out exactly what parts are actually being used can be an added hassle and one you’ll have to navigate by yourself. Contacting the original manufacturer of the equipment will often get you nowhere. These companies are worried about liability, especially if the used system was heavily modified or improperly disassembled / installed. Without any factory technicians there to verify the condition of the equipment, most manufacturers won’t help you if you have a used system. If your equipment has a critical parts failure, you’ll be stuck on your own. Hand-in-hand with the lack of warranty, used equipment is often sold without any sort of support from the original manufacturer. In fact, many oven manufacturers from the 1980s and 1990s are out of business. A few from the last ten or so years have also folded, so there is a chance you may buy an appliance that looks good but is totally unsupported. This can be a huge problem down the road if any wear parts are proprietary in nature. It can also be problematic for day-to-day operations, as there are fewer and fewer trained technicians still familiar with the minor problems that may arise with products from suppliers that are no longer in business. When buying used powder coating equipment and basing your decision on price alone, it can be tempting to purchase equipment that is similar to what you need, even though you know it is not an exact match to your requirements. This can be a costly and hazardous mistake. For example, buying a salvaged gas-fired oven that was used for curing ceramics or heat treating metal may seem like a great idea because the price is $10,000 lower than buying a new batch oven designed specifically for powder coating. In the long run, the oven may not be effective for your powder coating operation. Why? Because buying an oven with a recommended temperature range higher than a powder coating oven may result in over-cured parts and wasted money due to reworks. Trying to run a lower-temperature oven at powder coating temperatures can be extremely dangerous, especially if you are running the oven outside the recommended safety range by bypassing safety devices. In all cases, buying an oven that hasn’t been optimized for powder curing will result in fuel bills that are much higher than they should be. Buying the wrong oven for the job will cost you money in fuel and can cause powder overbake, damage the parts themselves, or be a fire hazard. There’s also the possibility that your code inspector will simply “red tag” your appliance and you’ll be unable to use it. A low price on used powder coating equipment may not make up for the potential expense of hundreds or thousands of dollars spent for rewiring and replacing controls. Capital finishing equipment is typically designed for each specific customer, and that includes correct wiring for that customer’s location and power source. If you buy used, you may find your equipment wired for single or three phase when you need the opposite. You may also end up with equipment designed for a voltage that is not compatible with your current power source. These differences can lead to significant rewiring and the need for a new or heavily modified control panel. Obviously, this will add to the cost significantly. We’ve encountered shop owners who bought used or salvaged equipment at auction and the power was designated only as “high voltage” or “3-phase.” They later learned that they had to choose between spending tens of thousands of dollars on a new incoming power supply to their coating equipment or dealing with the cost and delay of reworking the equipment so it was compatible with the power they had. Older equipment, especially ovens, will often have different and potentially outdated safety features than current models. If those older safety features cause code compliance issues with local inspectors, you will have problems that can take months to resolve. Imagine being shut down for two or three months after you get your equipment assembled because a flame safeguard in your oven’s control panel or a fire detection photo eye in your used high-end booth doesn’t work properly. Updating the oven or booth to meet code requirements can be costly. Choosing not to update can incur possible fines or your local Authority Having Jurisdiction may simply lock you out of your equipment. If this happens, it will be illegal for you to operate your coating equipment until it has been upgraded to meet certain performance or safety specifications. Even if no inspector is involved, the safety features of used powder coating equipment need to be checked and replaced if they no longer operate properly, as bypassed or outdated safety features can pose a serious safety risk to you and your employees. Many used systems have been salvaged. More expensive ones are usually shown under power and then torn down and packaged for shipment. Some used coating systems are missing key components, but it is hard for the buyer to know exactly what has been left out until the equipment is being installed at his facility. It isn’t uncommon to see used powder coating equipment outlets offering systems made from two (or more) salvaged appliances from totally different coating lines. These products are packaged together in order to make one complete system. Without knowing precisely what is missing and what has been replaced on the system, it is almost impossible to determine if a used powder coating system has all of the capabilities it was designed to offer. Two of the most expensive items to replace on a powder coating oven, the gas burner and the control panel, are the most likely to be absent, damaged, modified by previous owners, or just plain worn out. Replacing those two items alone can increase the price of an “inexpensive used system” by $10,000 or more before it can be used at a new location. Salvaged powder spray booths often lack useable filters. A complete filter set for a well-made cartridge filter system can easily cost over $1,000. A set of HEPA filters for a booth with a spray-to-waste filter system can cost almost as much. There’s also the cost of replacing old mismatched bulbs with new ones, replacing broken glass in light fixtures (required by code), and making sure the exhaust system has all of the motor and belt guards in place. Without the correct replacement parts, a bargain priced (but incomplete) used coating appliance can leave the new owner in a bad situation. Depending on the brand and the specific model, some powder guns that have been discontinued for only a few years may be all but worthless. These guns and their related reclaim/powder transfer systems may no longer have available replacement parts. Once they wear out, the only way to get replacements is to track down other used systems to salvage. What’s worse, if you aren’t dealing with one of the larger powder gun companies (Gema, Nordson and Wagner), used gun systems similar to the one you are buying may not have compatible parts, even though the gun model is identical. This is especially true of guns that are designed to look like brand name guns but have been manufactured in Asia or assembled in hobby shops in the U.S. using foreign parts. These low-end guns are commonly sold via the Internet, and we’ve seen products where key components have been changed multiple times within only a few months without any change to the model designation. Ovens expand and contract during operation. This can cause warping of the panels or weakening of structural components. Depending on how often, and in what manner the used oven was operated, the panels may not fit correctly after disassembly. Once relieved of the pressure created by fasteners and adjacent components, panels may deform. Any unusable panels will either have to be purchased from the original equipment manufacturer or provided through a custom fabricator. Additional bolts, self-tapping screws and/or sealant will also have to be used in order to prevent hot air from leaking through improperly fitting wall or roof panels. On many popular batch ovens, the doors are permanently fixed to a door frame assembly. Often these doors have been custom fitted in the field so that the doors operate properly even if the floor at the installation site is imperfect. 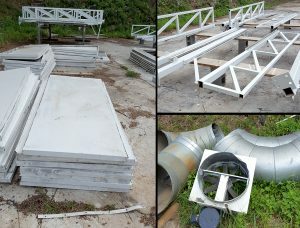 During reassembly, it is common for the door components on a used powder coating oven to require modification in order to work with the floor imperfections found at the new installation location. This can be another costly and time-consuming modification that will often require communication with the original manufacturer. If an oven has been installed or stored in a humid environment, the insulation can trap moisture against the interior of the wall panels. Although their construction is designed to deter rust, the panels of a used oven can be rusting from the inside out and the rusted panels will have to be repaired or replaced. Without tearing the panels apart, it is impossible to know if rust is going to be an issue. The oven may look fine, but a rust problem may not be apparent until it is too late to avoid costly panel repairs or outright replacement. The more an oven has been moved or disassembled/reassembled, the more likely it is that rust may be a concern. Most ovens feature 4” or more of mineral wool insulation. Reliant Finishing Systems is somewhat unique because our ovens feature 6” panels that can be completely broken down. This allows the buyer to be confident that each and every panel has been properly insulated. What we’ve learned from working with dozens of tons of mineral wool every year is that it often settles inside an oven’s panels—especially if exposed to a moist climate. We’ve taken apart a handful of panels from used ovens that were installed when new, then disassembled and sold a few years later as “like new.” The rigors of being shipped thousands of miles, then having the panels slammed together during assembly and snatched apart during tear-down caused the mineral wool inside to break down slightly. After a few years of use, the insulation began to settle. As a result, the “good as new” used oven’s wall panels had no insulation at the top of the panel. Another thing we noted was that after being subjected to high temperatures for a few years, the insulation became somewhat brittle. Instead of a stiff board of insulation inside, the panels had insulation that no longer evenly covered the entirety of the panel. This lack of fresh mineral wool throughout the entire oven construction leads to heat loss and safety issues. Even with our own ovens, a certain amount of insulation will need to be replaced if a Reliant oven is going to be moved and reassembled. When you buy new equipment, the manufacturer or the equipment dealer typically offers installation services. These services are provided at a set price and include calibration of the equipment. Factory-installed equipment should look good, perform well, and be safe and reliable. When you buy used powder coating equipment, one of the biggest hidden costs is the likelihood of the installation bill being significantly higher than originally expected. When buying equipment that is “as is, where is” at a low price, it is easy to forget about the cost of having the equipment torn down and packaged for transport. As an example, let’s consider a large batch oven and powder spray booth package that includes some structural steel supports. Let’s say that if the equipment is bought used it will save you $25,000 over buying new. Let’s estimate that the cost for having new equipment installed is going to be $15,000. It is reasonable to expect to pay more to have the used equipment built because technicians charge more to offset the delays that they anticipate with used equipment, so $20,000 is a solid estimate. Then you have to pay to have the equipment removed from the original site, which might cost $7,500, plus you’ll spend maybe another $2,500 to have the equipment broken down and containerized for shipment. So, you’ve saved $25,000 on equipment but paid out an extra $15,000 in labor compared to buying a new system. So, you’re still $10,000 ahead—until a problem crops up. What if some panels get damaged because they were screwed together instead of being held together by friction the way they should be? Perhaps the heat unit breaks into two pieces because the original installers failed to assemble it correctly. There’s no way an independent installation crew is going to absorb these costs because they didn’t build the equipment the first time. The original manufacturer is unlikely to offer to provide labor because they don’t want to inherit a bunch of problems or assume any liability from the previous owner. When working with factory-authorized crews that are assembling new equipment, installation goof ups should get taken care of free of charge. When dealing with used equipment, the meter never stops running. You have to deal with the unexpected costs. It is easy to end up spending so much on labor and repairs that the deal you got on your used powder coating equipment is no longer a bargain. These are just a few of a multitude of issues to be aware of when considering buying used powder coating equipment instead of buying a new powder coating system. Many of the problem issues can be monetarily quantified, so you can decide if the risk is worth it, but the peace of mind that comes from buying a quality powder coating system with a warranty, professional installation and years of factory support is hard to measure. This entry was posted in News on March 23, 2016 by Reliant News.